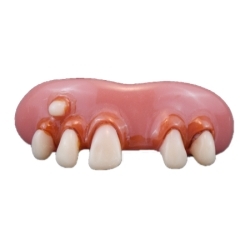 You can use this set of fake teeth from Billy Bob to recreate the characters from the classic 1972 movie "Deliverance". They can also be used to add the finishing touch to a number of different costumes such as hunters or rednecks. The Billy Bob deliverance teeth include one set of false teeth uppers and impression material that creates a custom, secure fit allowing you to comfortably wear them for extended periods of time.